The Ink Trap: Guess Who's Ms. June at Bombshell Stamps! Hey, all! Welcome back! Big news for me this month. I'm the guest designer at Bombshell Stamps for the month of June. Bombshell Stamps are near and dear to me as they were one of the very first stamp companies I fell head over heels in love with. They were also the very first Design Team I was invited to join and I spent a lovely year with them. What an honor it is to be asked to join them this month. PLUS, many of the same beautiful ladies I started with are still on the DT and I'm proud to call them my friends. I'm sending out a BIG kiss to all of them...MWAH! Since I'm the guess designer this month I get the honor of setting the theme. Those folks who know me well can sort of guess the theme I picked. I won't keep you in suspense...it's Getting Skully! YEP! It's easy to join the fun, just add a skull to your project in some way, shape or form and you've got it. I have use this set over and over again. It. Is. My. Favorite. Unfortunately, this set has been retired, but I was too caught up in the joy of using this set again that I failed to check and see if it was still available on the Bombshell Stamps website. OOF! Big mistake! Fortunately, if you visit the site, you'll find LOTS of other fabulous skull theme images, so all is not lost. Swing by the shop and pick out something skully and join my challenge this month. You'll have fun. Promise. 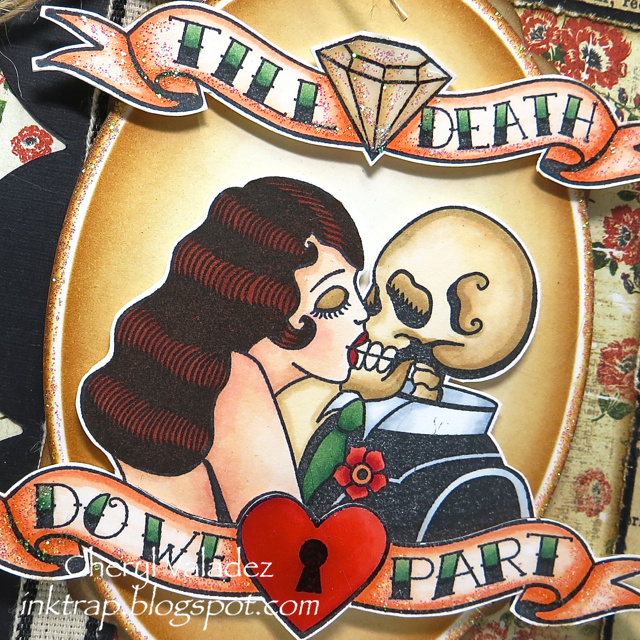 Visit the Bombshell Stamps Blog and check out all the loveliness that the wonderful Bombshells create. You'll find daily inspiration and eye candy available at your fingertips. Okey dokey, artichoke! Catch you in a little bit with another post. Yep, 2 in one day! Tootles!